Ben Heron winged his way to victory in the opening fixture of the Frostbite League at Priory Park in St Neots on Sunday (October 2). 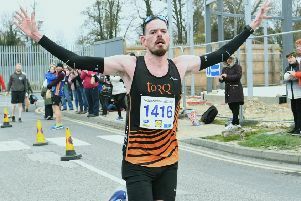 The 31 year-old high flyer capped an unprecedented day of firsts for Eye Community Runners, with Isaac Ellard sharing in the success by winning the junior race. Heron, who was first bitten by the running bug less than two years ago, chased down fast starting Nene Valley youngster Nathan Tweedie and pulled away in the closing stages to complete the five-mile off-road course in a time of 26.52, ten seconds ahead of Tweedie. Hunts AC won the team competition with Werrington Joggers reviving former Frostbite glories when finishing as runners-up. James Whitehead was the first Jogger home, finishing third. Whitehead was joined in the top ten by eighth-placed Paul Halford. Werrington’s cause was helped by Rachel Gibbs, who was first lady in 30:45 with Anne Wood and Jade Watson providing invaluable support. Chloe Pavey was in fine form for the Harriers finishing as fifth lady. Yaxley’s Simon Hearty provided one of the day’s highlights with a fifth-place finish. The junior race, held over a distance of little more than a mile and a quarter, was won at a canter by Ellard in a time of 6:56. The Eye athlete has been featuring prominently in senior races in recent months, and was in a different class to the rest of the field. Nene Valley’s Matthew Dowling was runner-up in 7:24, just four seconds ahead of the leading lady, Shannon Flockhart of Hunts AC.